This isn’t totally library or kid lit-related, but I felt I needed to post it. Both because I feel it’s relevant to today’s events and (mostly) because it makes me laugh. And laughing feels really, really good right now. My daughter wasn’t at school today (she had a fever), so I haven’t had to explain the Connecticut school shooting to her yet. I’m not looking forward to the discussion. She tends to get panicky about guns and “robbers” whenever she hears about a local crime, but she’s going to hear about it eventually, so, as her parent, it’s my job to make sure she has the necessary context to help her try to process the event. Context – the search for clues that lead toward deeper meanings – is one of the most important things in the world for a kid, which is one of the reasons why I’m such a big proponent of reading. Reading gives kids the ability to access context and meaning on their own and that’s an incredibly empowering skill to have. All kids go through a period where they keep asking their parents “WHY?”, so giving them the ability to answer that question themselves is just one of the most important things in the world. BUT it is good to know that, even without her father clumsily trying to help her find deeper meaning in the world, my daughter still knows that some truths are simply self-evident, even for a six year old. These were the rules that the three girls decided were SO important for playing that they felt the need to write them down. 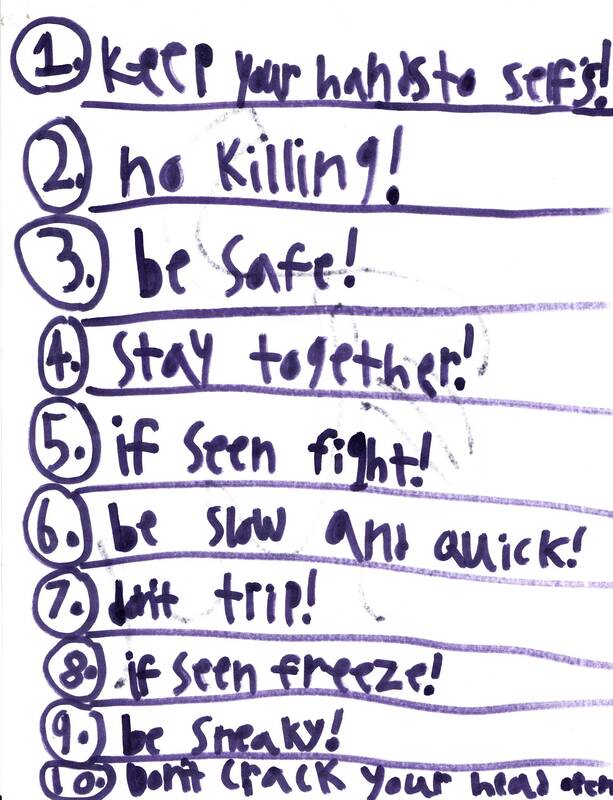 And, so, without further ado, here are the TEN COMMANDMENTS OF PLAYING SPY, as written by my daughter and her two newest best friends forever. 6. BE SLOW AND QUICK! I love these rules so much. I love how they’re earnest, silly, and profound all at the same time. I love the zen cool of being both “slow and quick”. I love the sheer practicality of rule #10. 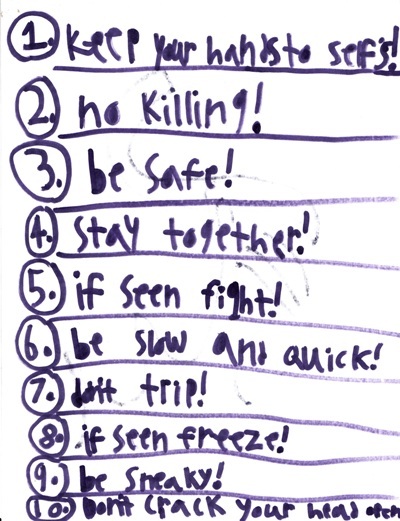 And I love that “NO KILLING!” is rule #2 (just couldn’t make the top spot, I guess). But I mostly love that kids are just these brilliant, empathetic creatures who know how to value life, creativity, and cleverness over everything else. I love that kids KNOW – and they know it enough to put it in writing – to keep their hands to their “self’s” and not kill each other, even without the watchful eye of dads, moms, or anyone else hanging out in the basement and ruining their good time. Don’t get me wrong. Kids can be idiots. But, on days like today, it’s nice to look at a list like this and know that, more often than not, they’re pretty damn great too. I agree 100%. I also love how you can hear your own voice in their rules (I’m assuming #1 & #10 didn’t just come out of thin air). During the election my 1st grader’s class was given an assignment to write and draw what they would do were they elected president and my daughter’s answer was “Tell everyone no smoking!” (actually, “no smocking” but the illustration made it pretty clear what she meant).